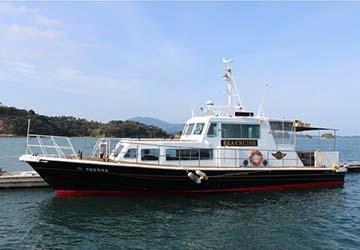 Amakusa Takarajima Line operates ferry routes between the Kumamoto Prefecture mainland and Amakusa Islands in southern Japan, offering excursions to and from the ports of Misumi, Hondo and Matsushima. 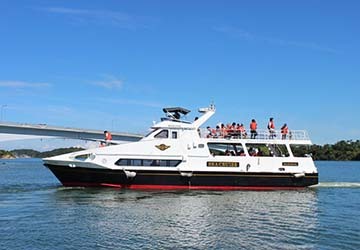 With their three ferries, Vista Bonita, Marisol and Serena all created by a leading industrial designer, Amakusa Takarajima Line offers a superb cruising experience with top quality vessels. 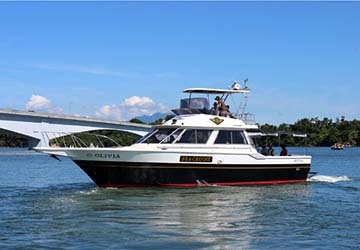 Each ferry boasts an air-conditioned lower deck with comfortable seating, excellent toilet facilities as well as spacious viewing decks, allowing you to enjoy the stunning views of Mt. Unzen and the impressive Amakusa Gokyo bridges during your journey. When sailing with Amakusa Takarajima Line, don’t forget to bring your camera as the islands are renowned dolphin-watching locations, so be on the lookout for the fascinating species as you cruise by. With directferries.co.uk you can find Amakusa Takarajima Line timetables, fares and book Amakusa Takarajima Line ferry tickets. Where applicable we’ll also compare Amakusa Takarajima Line with alternative ferry companies.